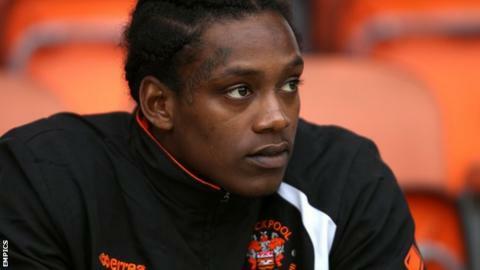 Blackpool striker Nile Ranger has apologised to the club for his seven-month absence and recent behaviour. Ranger was pictured in Seasiders training kit last week, but boss Neil McDonald said the forward had "no future" while he was in charge. In a statement on Twitter, Ranger explained that recent life events have distracted him and stated a desire to re-start his career. "I have seen two of my good friends pass away," the 24-year-old said. "Whilst overcoming this it has made me realise life is really short and I have really been taking things for granted. "I would like to use this opportunity to thank Southampton, Newcastle, Swindon and Blackpool for giving me the chance to experience the dream of being a professional footballer. "To add to this I would like to apologise to everyone at these clubs including management, players, staff and fans. I should have given more and been a better role model. "I would also like to add I am sorry to my current team-mates at Blackpool for being missing for a long period of time and not attending pre-season and putting in the hard work during this time." Ranger has not played for Blackpool since November 2014, but still had his contract extended in the summer. He added: "Truth be told I'm just a young boy who has been living the dream and playing a game which I do love and miss deeply, and hope that one day I will be able to get back on a pitch and play because life is really too short."